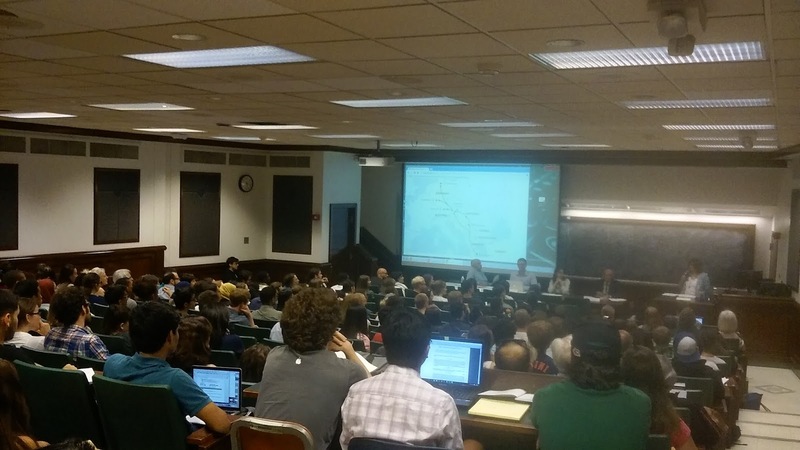 On September 22nd, a teach-in about the recent refugee crisis in Europe was held at the University of Illinois at Urbana-Champaign. 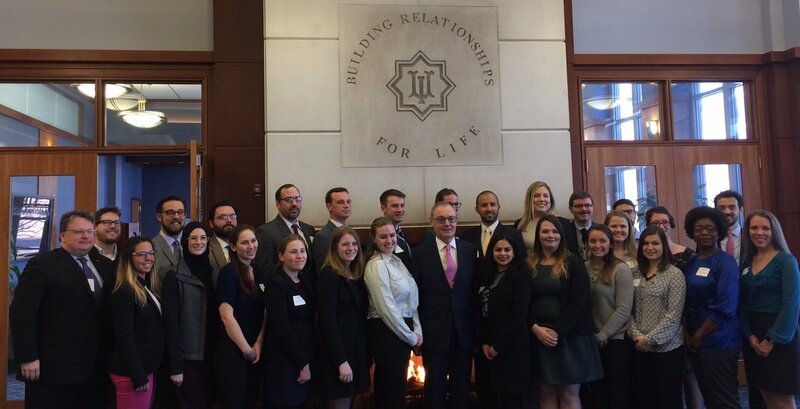 The European Union Center was one of the sponsors along with: The Center for Global Studies, Program in Arms Control & Domestic and International Security, Center for South Asian and Middle Eastern Studies, The Unit for Criticism and Interpretive Theory, Women and Gender in Global Perspectives, and Illinois Program for Research in the Humanities. 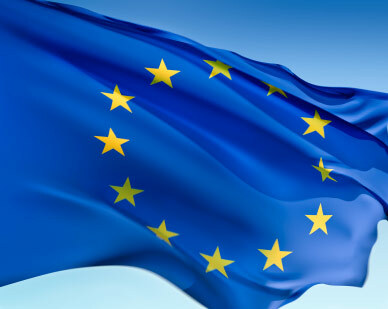 This article was written by Raphaela Berding, a MAEUS student with the European Union Center. The auditorium in Bevier Hall was packed. Many students followed the invitation of the European Union Center and the Center for Global Studies for a teach-in on the refugee crisis in Europe in which four speakers looked at the diplomatic, political, social and humanitarian law implications of the influx of large populations of refugees coming mostly from Syria into Europe. 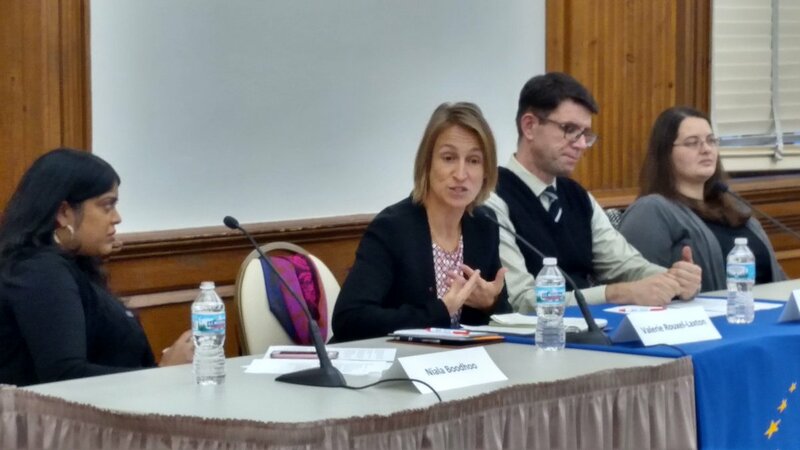 In their respective fields, Herbert Quelle, Consul General of the German Consulate in Chicago, Zsuzsa Gille, Professor in Sociology, Kostas Kourtikakis, Professor in Political Science, and Lesley Wexler, Professor in Law from the University of Illinois presented important information related to the crisis. Gille and Quelle also talked about the situation in Hungary and Germany, two countries that have been constantly present in the media during the last weeks for their stance on the crisis. They neutrally reflected on how their countries face the crisis and gave their opinion. Gille, who is from Hungary, pointed out that it is important not to judge all Hungarians for rejecting to take in refugees. At the end of their talks, students had the chance to ask questions to the panelists. The fact that they came from many different fields, such as History, Political Science or Engineering showed that the crisis is affecting everyone and that it has drawn attention to people all over the world. The teach-in left people very satisfied. At the end of the day, the question about what will happen in Europe and how the situation will develop remains. 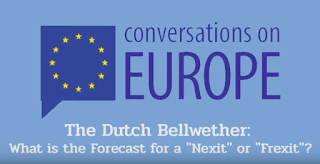 One can only make speculations about the progression of the crisis, and about whether or not Europe will handle it positively and adapt to new circumstances. There is also speculation about which solution the heads of the nation states will come to, which is especially important. As Kourtikakis claimed, what is often forgotten in the debate about the refugee crisis is the second crisis, that Europe has not overcome yet. This article discusses a lecture that was co-sponsored by the European Union Center. The original article was posted by REEEC (Russian, East European and Eurasian Center) on September 17, 2015. The author, Adrianne Gorbachik is a REEES MA with a focus in Sociology. 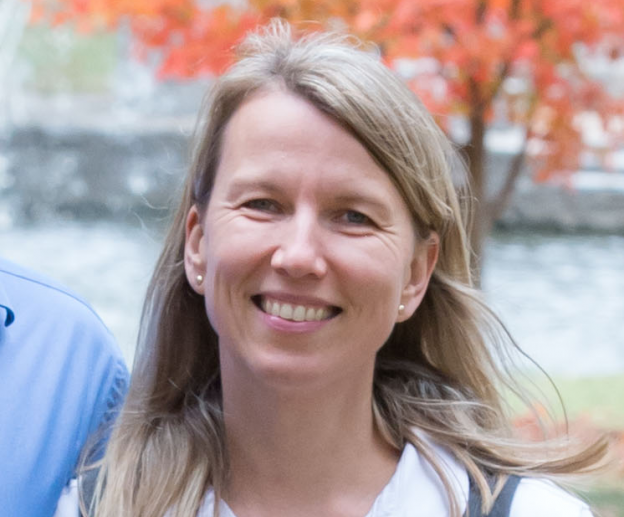 In the past she has studied environmental policy between Finland and Russia. She is currently working on her master's thesis. 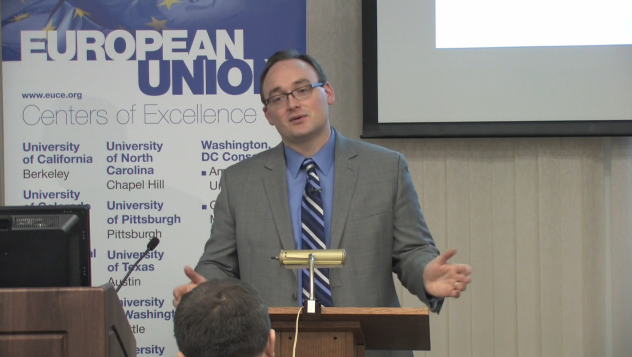 Dr. Gille addressed Hungarian national identity and the complexity of Hungary’s EU relationship. EU accession promised Hungary a stronger democracy, currency, and place in world politics. Current statistics, however, point to radically different outcomes. Since Hungary’s accession, the poverty rate has hit astronomical highs, followed by a falling GDP per capita ranking, and the identification of Hungary’s Prime Minister Viktor Orbán as head of the second most corrupt political regime in the world, according to the Organized Crime and Corruption Reporting Project. FIDESZ, the Hungarian conservative party, has consistently been the most popular political party in Hungary since 2010, which raises the question of whether the European outcome promised is still what the people of Hungary desire. Dr. Gille attributes the party’s continued popularity to common feelings in Hungary that political influence within the EU is rigged, creating a disenchantment with European visions, ideals, and the EU itself. She notes that the three scandals Hungary has faced during its European Union membership have impacted these national attitudes. In 2004, paprika produced in Hungary was found to contain a carcinogenic mycotoxin due to imported peppers from Brazil and Spain. Paprika is prominently featured in Hungarian cuisine and considered a Hungaricum (encapsulation of Hungarian culture). Hungary had heavily modified their regulations to fit EU standards, however, Spain’s EU membership meant that the Spanish peppers used in Hungarian produced paprika no longer required testing. Hungarian paprika imports were suspended within the EU and Hungarian paprika’s image was quickly destroyed. Hungary’s requests that the European Food Safety Authority test aflatoxin levels on imported peppers from Spain were denied. The second scandal involves foie gras, which Hungarians historically enjoy in celebration of the day of Saint Marton (November 11th). This specialty is produced after fattening geese by means of force-feeding (gavage). In 2008, an Austrian organization named Four Paws blacklisted the Hungarian foie gras industry, claiming that the delicacy is produced inhumanely and that birds fattened through force-feeding are diseased. Quickly after the boycott Austrian and German supermarkets removed Hungarian foie gras products, resulting in a loss of almost 19 million dollars. Lawsuits later ensued, claiming that the organization Four Paws was actually funded by the German and Austrian foie gras competitors wishing to remove Hungary from the market. In 2010, Hungary was devastated by the Red Mud Disaster. Red Mud is a highly caustic byproduct of aluminum production. On October 4th, a reservoir holding the derivative broke, flooding three villages and killing ten people. In complying with EU legislation, Hungary had removed red mud from its list of hazardous waste. This led to less care being taken when disposing of the dangerous byproduct. These cases demonstrate Hungary’s national attitude that the EU has failed in delivering promises of safer food, environmental responsibility, and currency growth. Dr. Gille concluded her lecture by offering a solution of more transparent policy-making in the EU and adding higher levels of accountability, therefore alleviating Hungary’s suspicion and mistrust of the system. Her theoretical approach to these case studies are insightful and inspiring to other scholars delving into matters of globalization, identity, and materiality. This article was written by Doug Petersen, and it originally appeared on the "News" web page for the University of Illinois at Urbana-Champaign's College of Liberal Arts and Sciences in September 2015. This summer program is co-sponsored by the European Union Center at the University of Illinois in Urbana Champaign through a US Department of Education Title VI Grant. Giving up all liquids and food from dawn to dusk every day for a month sounds difficult enough. But how about trying to fast from food and drink all day when you are a high school football player running wind sprints in full equipment? The complicated pairing of faith and football was the topic of just one of the movies that students viewed while attending the 2015 University of Illinois Summer Institute for Languages of the Muslim World. To bring awareness to Muslim cultures and teach language at the same time, instructors used films such as the award-winning documentary, “Fordson,” which describes the life of football players at a predominantly Arab-American high school in Detroit. Muslim players struggled to combine fasting with football during the month of Ramadan. Daily classes at the Summer Institute for Languages of the Muslim World, or SILMW, formed the foundation for learning Arabic, Persian, Swahili, Uzbek, Wolof, and Turkish. U of I students also immersed themselves in these languages and the cultures of Middle Eastern and African countries through an array of co-curricular activities, with movies being one of them. The summer of 2015 was the eighth year for the program, which packs an entire year of learning into eight weeks. According to Saadah, students receive two semesters of instruction and can earn up to 10 credits during the two four-week semesters. Some of the Middle Eastern and African languages taught at SILMW this past summer have been designated as “critical languages” by the United States government—important for national security reasons. Arabic, for example, is one of the official languages of the United Nations and is spoken by 350 million people in Africa and Asia, from Morocco to southern Iran. Arabic and Swahili are the most popular of the languages offered, so Swahili was taught at both the elementary and intermediate levels, while Arabic was taught at the elementary, intermediate, and advanced levels. The other four languages were taught only at the elementary level. The summer institute is open to both Illinois and out-of-state students (who pay in-state tuition rates), and it is even open to high school students. The program gives continuity to language instruction, Saadah says, by offering students the option of continuing or beginning their language instruction during the summer. While some students see the program as a way to take care of their language requirements during the summer, others see it as an important step before studying overseas or doing research abroad. The program attracts students from across campus—history, political science, music, engineering and more. After each day’s lectures were over, students attended a variety of co-curricular activities. On Monday, students listened to special presentations about their respective languages and cultures, such as programs on the political system in Pakistan, as well as on Sufi Muslim resistance to the French colonial system in Senegal. On Tuesdays, students attended “conversation tables,” where they met at coffee shops with their instructors and talked in the language they were learning. Wednesday was movie day when they watched a film representing each language group. 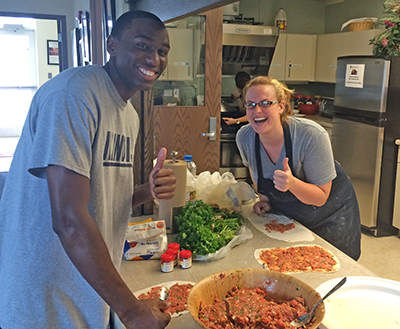 And on Thursdays, they cooked and ate together in the Asian American Cultural Center. As they ate, they learned about dining customs in Muslim countries. The 2015 group also took a field trip to Chicago, where they walked through the Bridgeview area with its many Middle Eastern shops. In addition, they went to the Oriental Institute of the University of Chicago, a museum that features artifacts and information about ancient cultures and the development of language over time. The summer session culminated with a language showcase, in which each group put on a skit—often musical or humorous. For instance, Turkish language students danced and sang well-known Turkish pop songs, as if they were participating in a popular singing contest. An Arabic language group spoofed Celebrity Jeopardy with students playing the roles of Alex Trabek, Sean Connery, and several Middle Eastern leaders. As Saadah explains, it all adds up to an intensive and immersive language and cultural experience. “I strongly believe that SILMW has been one of the best immersive language-learning summer institutes in the Midwest,” she says.